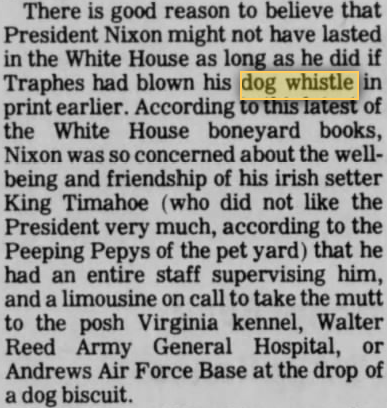 Stated differently: Trump puts out the dog whistle knowing that some dog will hear it, even though he doesn't know which dog. I assume that the meaning is something similar to double entendre where a statement can be interpreted a few different ways. But why use "dog whistle", specifically? And where did the term first originate? His criticism of welfare was a dog whistle appealing to racist voters. A type of political speech using code words that appear to mean one thing to the general population but have a different meaning for a targeted part of the audience. The term dog-whistle politics originates from Australian English, and was introduced to the UK by Australian political strategist Lynton Crosby, who was involved in the 2005 Conservative Party election campaign. Crosby had helped Australian Prime Minister John Howard to four consecutive election victories, with the focus of the campaigning on so-called dog-whistle issues, an expression in use in Australia since around 1997. The dog-whistle analogy was drawn from Australian sheep-farming, where a farmer uses a whistle which is only audible to one dog. This idea was taken over into political contexts as a way of describing a message aimed exclusively at one section of the electorate. A "Silent" Dog Whistle.—Animals, of course, can hear higher notes than we can, and with a little ingenuity it is possible to make a whistle that cannot be heard by human beings, but to which a dog answers readily. Dogs can hear better than humans but not quite as well as cats. They can hear sounds that we cannot and can listen for a familiar footstep long before it comes within human earshot. The so-called Galton whistle or silent dog whistle is not silent at all. It is pitched at a frequency too high for the human ear but quite clear to the canine or feline ear. dog whistle politics The use of messages embedded in speeches that seem innocent to a general audience but resonate with a specific public attuned to receive them. Commenting on the President's historical reference [in 2004 to the Supreme Court's 1857 Dred Scott decision, which was overturned eight years later by the thirteenth amendment], David D. Kilpatrick wrote in The New York Times: "The potential double meaning rekindled speculation among Mr. Bush's critics that he communicates with his conservative Christian base with a dog whistle of code words and symbols, deliberately incomprehensible to secular liberals." The message would be pitched high enough to rally the whistler's core constituency without unduly arousing the opposition. The political dog whistle may have derived from the term's use by pollsters. 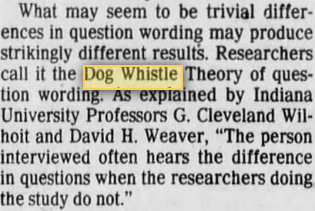 Richard Morin, director of polling for The Washington Post, observed in a 1988 article that "Subtle changes in question-wording sometimes produce remarkably different results.... researchers call this the 'Dog Whistle Effect': Respondents hear something in the question that researchers do not." The effect has been noticed in other fields. In 1989, Russell Smith noted in the Dallas Morning News that an MTV spot "which has no obvious reason to exist, is like a secret signal, a dog whistle blown on thirtysomething frequency. Come back, MTV beckons, in a language it hasn't spoken in years." Two years earlier, in New York magazine, Geraldine Stutz, three-decade president of Henri Bendel in New York City, described her taste in "Dog-whistle fashion," meaning that she specialized in stocking in her store "clothes with a pitch so high and special that only the thinnest and most sophisticated women would hear their call." As for why the film resonated so well—especially for men—[Tim] Busfield has a theory involving the film's score. According to Busfield, "There's a note that James Horner hits in his music about the time when Kevin's character says to his dad, 'You wanna have a catch?' There's a note that he hits that's like the dog whistle for men's emotions. It sets off something that men, the emotional side of men, just lets go." The key feature of this election campaign has been a clever use of what professionals call "dog whistle politics". A dog whistle is pitched so high that dogs hear it but humans do not. Dog whistle politics involves pitching a message to a particular group of voters that other voters do not hear. As Oliver North comes to BC muzzled by his lawyers, since he is under indictment, going to hear him "talk" is like listening to a bird dog whistle. Ultimately, it is unclear whether Professor McNally's point was that North's speech wouldn't be worth hearing because it would be (metaphorically speaking) pitched beyond the hearing of human listeners in order to minimize North's legal liability for anything he might say, or whether he was implying that only listeners attuned to North's dog-whistle language would be in a position to grasp the true significance of his remarks. The former possibility strikes me as being rather more likely. I would be remiss if I didn't acknowledge the astounding discovery by Dr. Rafik Tajerian of Budapest, Hungary, that a specially (albeit accidentally) modified silent dog whistle "can stifle a grown man's wandering eye." You can read all the details—including a Before and After dramatic photo reenactment of the whistle's effectiveness—in "Hold It, Mister! Ultrasonic Whistle Stops a Cheatin' Man in His Tracks," in Weekly World News (January 22, 2002). The report of this scientific breakthrough undoubtedly would have earned above-the-fold front-page billing if not for the competition from a shocking historical exposé, "Abraham Lincoln Was a Woman!" Aside from the significant philosophical and practical overlap between dogs, politicians, and cheatin' men, this story has nothing to do with "political dog whistles"—but I strive to be fair and balanced in my presentation of all the crucial information that I encounter in my research. The term originated with American (racial) politics. It is somewhat synonymous with coded language. What I think Wikipedia glossed over is the implication that those who hear what is really being said are somehow sub-human (dogs). The idea is that there may be a quandary where you'd like to appeal to a certain voting block (like racists) by talking about their issues, but overtly expressing support for racisim is odious to the public at large. So you have to use a code that sounds like it is talking about a completely bland political issue, rather than the thing the rest of the public considers evil. The metaphor of a dog-whistle is used because most people don't hear anything racial, or at least can't prove that's what you were saying so they can ignore it if they want, while those people who immerse themselves in one side of this issue know those terms are in fact really about race, and come running to you like a dog that has just been called for. In theory, only the racists hear the racist language. Using it for this Trump quote was a bit of a stretch, but here's the logic: People who are heavily immersed in the USA gun culture tend to culturally believe that a big reason for having the 2nd Amendment is so that the people have the option of fighting back against a tyrannical government. So if you are deft enough you can talk about the 2nd Ammendment, and people who are part of that culture will know you are talking about using guns against the government. The problem here is that Trump isn't very good with dog-whistles (which actually seems to be part of his appeal to a lot of people). So when he tried to actually use one here, he was too explicit and everyone knew exactly what he was talking about. To extend the metaphor, everyone heard the whistle, not just the dogs. The high moral tone we had been proclaiming has risen to an indectable dog whistle. Polit. A statement or expression which in addition to its ostensible meaning has a further interpretation or connotation intended to be understood only by a specific target audience. In the "peace and security" classification, Bradley said he quarreled with his [Murray's, the Unruh campaign spokesman responsible for the mailer] characterization of his [Bradley's] record: "Would use gimmicks: 'dog whistles' for school problems; community involvement; use of revenue sharing funds for more police equipment; is a retired policeman." Although that use may express the sense of 'coded messages', it is not entirely clear to me that it does, and other interpretations might be better. Next was a clear reference to the sense of 'coded message targeting a specific audience', in an 6 Oct 1988 article titled "There's no Joy in Campaign" (Hunter Thompson writing in a syndicated column from Aspen, Colorado; as reprinted in the Arizona Republic). Last week was a good one for the dog-whistle crowd. First came the "Statue of Elvis Found on Mars" that hit the supermarkets — and then it was President Reagan's sudden decision to fly up to New York and deliver his "final farewell speech" to the U.N. Assembly. While nothing precludes Thompson's having adopted the term from the source mentioned by Morin (public polling "researchers"), Thompson's use, aside from having appeared slightly earlier, appears to be much more clearly in line with the well-defined political sense the term later acquired. Name for phrase only understood by those who already know?